Fancy gym memberships, expensive personal-training sessions, cryotherapy, juicing delivery services, and $200 yoga pants are just a few of the ways our country has lost its ever-mindful mind about "getting healthy." You do not need to spend hundreds per month, or thousands per year, to get healthy. All you need to spend is $250 per year, or roughly $21 per month. Here's how. Hands down the biggest expense you’ll have is shoes. Everything starts and ends with your feet, so investing in quality support is a must. The good news is, as long as you’re not an avid long-distance runner or walker, you can probably get away with buying just one pair of athletic shoes per year. 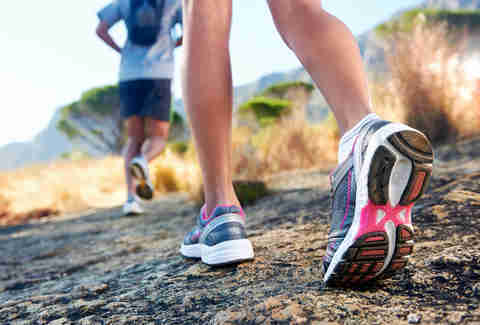 The rule of thumb is to replace shoes every 500 miles, so if you’re using them for circuit workouts, jump rope, or an average of less than 10 miles per week walking or running, you can make them last. Try on multiple brands and styles to find your best fit and aim for a mid-range price point (say, $60 to $80) from a well-known brand. There’s absolutely no scientific reason to purchase more expensive footwear -- a fairly comprehensive survey indicates brand-name shoes in low- to mid-range price points are every bit as beneficial as their more expensive counterparts (if not more beneficial). Also, don’t overlook sales. I recently lucked out and got an amazing pair of Nikes for $37 that were usually priced at $110. I ended up buying two pairs in my size because the deal was so good. After shoes, clothing is your next big expense, especially if you’re a woman. Women’s workout apparel tends to cost more than men’s, and there’s more of it to buy -- women need sports bras to keep “the girls” in place, and they’re not cheap! My suggestion is to head to T.J.Maxx, Target, Nordstrom Rack, or another discount store and grab marked-down pieces. Some online-deals sites, like The Clymb and zulily, also offer good deals on athletic apparel. The thing is, there’s absolutely no reason you need to spend more than $20 on a shirt or pair of pants, and in many cases you can stock up for less than that. My suggestion is to budget about $100 to buy two complete outfits of very basic apparel: black shorts or yoga pants, a black or gray wicking T-shirt, and two great sports bras (if you’re a woman). You can always rotate in T-shirts and tops you already own to mix up your look, and by sticking with the basics, no one’s going to wonder why you keep wearing the same pair of shorts for every workout. If you’re spending about $170 for shoes and apparel combined, that leaves you with about $80 for home fitness equipment. It might not sound like much, but it’s actually a very generous budget. Choose two to three items based on your interests and needs, aiming to create a well-balanced home gym. For instance, my go-to home options are a jump rope, yoga mat, and a set of dumbbells; they cover all the bases, don’t take up much room, and allow me to incorporate variety into my workout routine. Newsflash: you don’t have to spend a single cent to receive instruction from top trainers and fitness instructors. YouTube channels like BeFiT provide full-length workouts for free, while individual trainers’ social media accounts are packed full of high-quality routines of every type and style. Sure, it requires a little self-motivation to seek them out and follow them, but they’re free. 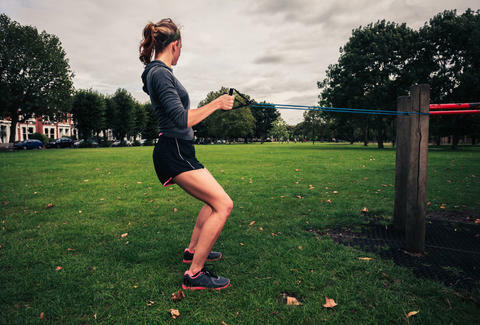 Laura Williams is an exercise physiologist and fitness writer who's every bit as likely to wear a ratty old T-shirt to work out as expensive activewear. Share your own budget tips on Twitter: @girlsgonesporty.